Campeggio Tours Val de Loire si trova a Saint-Avertin, Indre e Loira, è situato fiume/torrente e a un lago. Questo campeggio dispone di piazzole delimitate e piazzole poco ombreggiate. È possibile affittare tende, chalet e bungalow. Per gli sportivi, il campeggio prevede diversi percorsi in bicicletta. Al campeggio Camping Tours Val de Loire è possibile praticare windsurf. Ogni anno un ispettore visita il Campeggio Tours Val de Loire, controllando oltre 200 tra attrezzature e altri punti di interesse del campeggio. L'ispettore è un dipendente ACSI e non lavora per il campeggio. This is a convenient site for an overnight stop. The nearby town was closed by 6pm so no restaurants available if you need one. There was limited supply of food and drink in shop and croissants in morning were very good. The staff were friendly and helpful. Stayed for one night. Site good but near very sleepy village - nothing open after 5pm. Good for one night stop with friendly and helpful staff. Alright for stop over, toilet facilities as dirty in the evening as in the morning. noisy since next to highway. Good inflatable was cool for kids. Seems to be a hangout for homeless since they were present. I sort of get the feeling that this is a site with great potential that isn't quite making it. The receptionist was brilliant and has a sense of humour that translates into English. She worked very hard when we were there, all be it for just one night. We were there early in the season but got the impression that a lot of capital has been spent, but isn't being managed well. It's as if the site has been sort of abandoned by rich owners who have lost interest. We had a good one night stop in the long grass and enjoyed watching the rabbits. 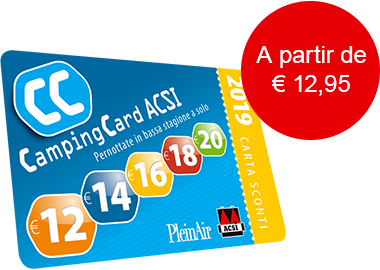 ACSI Eurocampings invia la tua richiesta di informazioni al "Campeggio Tours Val de Loire".